Today at the SAE Convergence 2010 Conference and Exhibition, Microsoft Corp. announced the availability of Windows Embedded Automotive 7 to select car makers and suppliers in the automotive industry. Designed to support the development of new infotainment systems, Windows Embedded Automotive 7 is an industry-leading platform providing integrated services for communication, entertainment, navigation and information for the mass market. With Windows Embedded Automotive 7, car makers and suppliers have access to Microsoft's latest tools and technology, as well as a worldwide partner ecosystem, which allows them to quickly create in-vehicle experiences that are easier to use and more engaging for drivers and passengers. Key features include speech commands, touch input, hands-free Bluetooth phone communications, advanced dashboard systems for access to music, maps, third-party apps and navigation, and streamlined connectivity with other devices. "Microsoft deeply understands that technology collaboration is paramount to the evolution of integrated, in-vehicle infotainment systems," said Kevin Dallas, general manager of the Windows Embedded Business Unit at Microsoft. "We are excited to create new opportunities with Windows Embedded Automotive 7 working with our broad ecosystem of partners to bring the best in entertainment and productivity solutions to drivers and passengers around the world." Silverlight for Windows Embedded. Silverlight for Windows Embedded gives car makers the ability to quickly create rich device user experiences with engaging 2-D and 3-D graphics by using a familiar Microsoft technology and taking advantage of a large ecosystem of Microsoft Silverlight designers. Experiences built in Silverlight for Windows Embedded can be refined rapidly on the desktop and deployed unchanged to the target device facilitating flawless delivery from designer to developer. Microsoft Tellme speech technology. Microsoft Tellme speech technology powers simple and hands-free system commands such as allowing the entire interface to be driven through speech. In addition, new support for SMS reply by voice allows text message replies to be constructed by speech. Windows Embedded Automotive 7 also supports eight languages: U.S. English, U.K. English, German, Mexican Spanish, Continental Spanish, Canadian French, Continental French and Korean. Next-generation automotive system tools. New tools for developers support the stable integration of advanced, high-performance, third-party systems and include improved test modules with easy-to-use product engineering guidelines to help simplify the development process, increase reliability and speed time to market. "Consumers are increasingly demanding access to new multimedia content, productivity solutions, and connected services for entertainment and communication from their in-vehicle system, similar to what they expect from their other devices," said Thilo Koslowski, vice president in the Industry Advisory Service Manufacturing group at Gartner Inc. "To build and deploy compelling in-vehicle infotainment system, experienced technology partners, car makers and suppliers must come together. The result of these collaborations turn the automobile into a seamless extension of the digital lifestyle." Ford goes global with SYNC. This month, Ford announced that MyFord Touch, the second generation of Ford SYNC, built on the Windows Embedded Automotive platform, is launching in Europe and Asia early next year. SYNC has been installed in more than 2.5 million vehicles in North America since its launch in 2007. Nissan LEAF information hub. 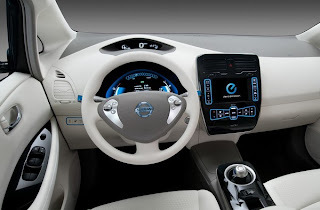 Today, Microsoft also announced that the 2011 Nissan LEAF touchscreen information hub is powered by Windows Embedded Automotive technology, providing drivers and passengers with a navigation system and electricity charging station locator. It also shares power consumption monitoring information with drivers, and enables easy in-car climate monitoring. Fiat. Fiat Group Automobiles is bringing the Fiat 500 to the North American market in 2010. The 500 includes Fiat's Blue&Me technology, powered by Microsoft, a media gateway that integrates mobile phones and digital music players into audio system and controls of the car, allowing voice control of these devices by the driver. Alpine. Alpine Electronics of America Inc. delivered advanced in-vehicle navigation systems, powered by Windows Embedded Automotive, to car manufacturers, including satellite-guided, turn-by-turn directions and useful features, such as voice-guided controls, and information on more than 7 million points of interest.